With the coming of half term comes the start of the main visitor season at the farm. We are now open to visitors from 1030 to 1700hrs every day. Its good that the visitors are back to see the horses, but for a few more weeks it puts some pressure on us. Currently the troops are in stables overnight and will stay that way until the weather perks up – probably end of March(ish). So we have to take the horses out and have the stables mucked out and ship shape before opening time. Main reason for the time pressure is using the small tractor and trailer to shift the muck out and the straw in makes life a lot easier but we can’t use them when we are open. Once we are mucked out we will bring a couple of the horses in for the public to see and meet-one of them will do Meet the Shire at Noon. After Meet the Shire typically we will swap a couple over. If they spend too much time in the stalls they get a bit bored. Of course the other thing that starts in earnest now is pre-season training. We need to get the gang back to peak fitness and raring (in a sedate manner) to go. They get harnessed up to remind them of the weight. They get ridden to help with their fitness levels and reinforce their awareness of the commands. 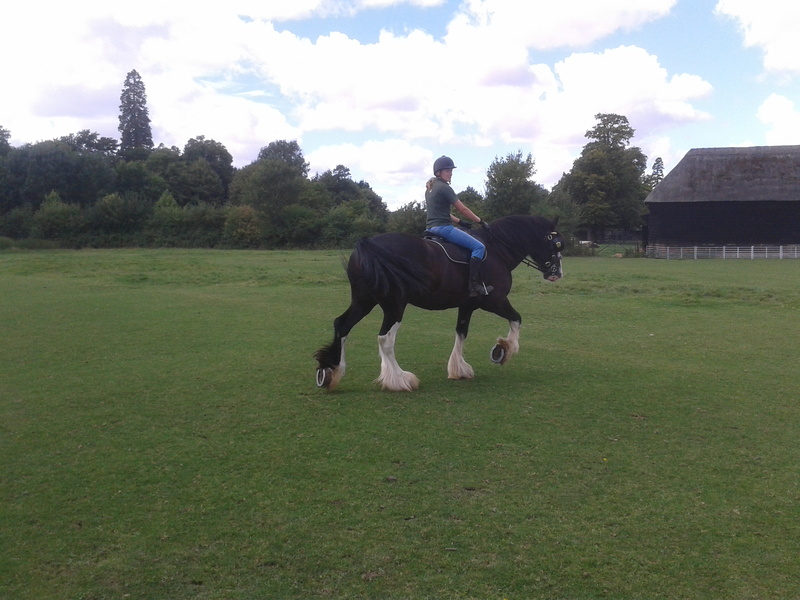 Some people think it’s just Emma enjoying herself having a hack round the park – well she is enjoying herself but also training the horses, getting them fit and showing them off to the visitors. They get longreined to remind them of working while being controlled by two reins. 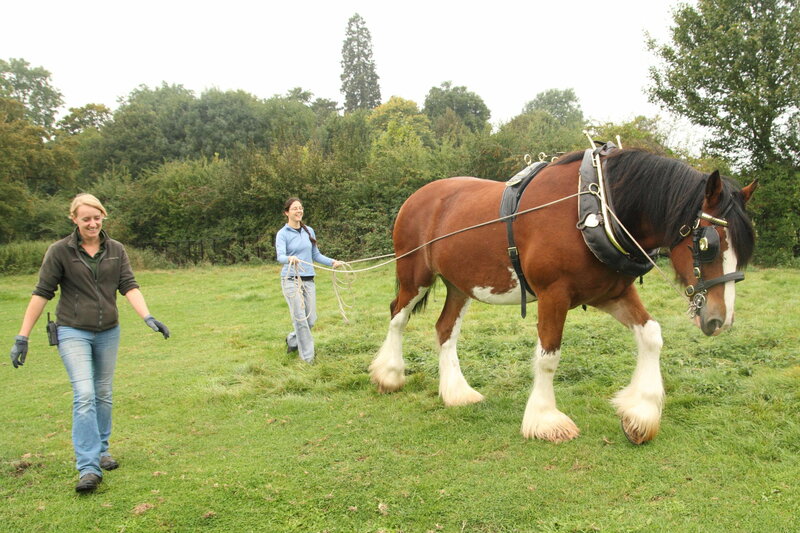 They also pull the sledge to remind them of working while pulling some weight – helps the fitness levels as well.I get fit as well because when I am grooming I get to walk where the horse walks. I’m just happy they haven’t found a harness that fits me. Of course there are some who try and dodge the work . . .
Harry decided to hide with the sheep in the hope we wouldn’t find him for worktime. Luckily he forgot to put on his woolly jumper – so we found him. B-E-A-U-T-I-F-U-L horse! Draft horse, I know. 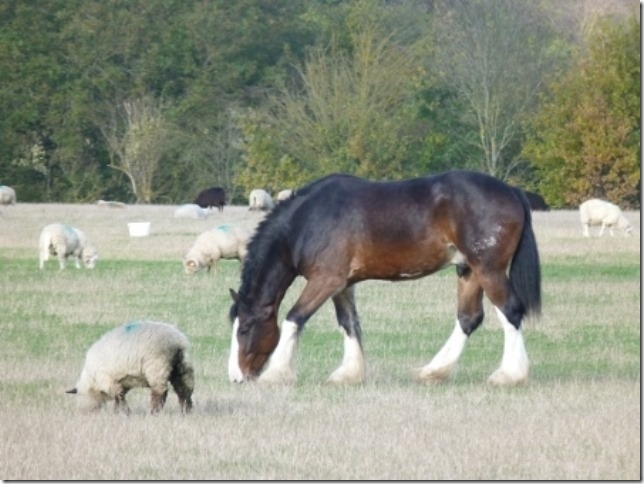 Is it a Shire or a Clydesdale?